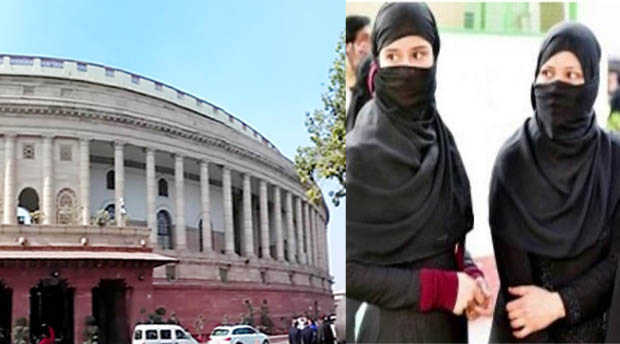 New Delhi: The Lok Sabha on Thursday passed the fresh version of the much talked about Muslim Women (Protection of Rights on Marriage) Bill - popularly called Triple Talaq bill. The House had to take the Bill again within a year as it was stalled in the Rajya Sabha and in September this year, the NDA government had brought in an Ordinance that made the practice of instant triple Talaq illegal and void, and also that the husband can attract a jail term of three years. Put to vote, 245 members gave their nod to Bill while 11 voted against it. Just before the Bill was taken up for voting, Congress floor leader Mallikarjun Kharge insisted that the draft law had several lapses and it violated the provisions of Article 45. Quoting various reports and survey findings, Mr Prasad said the Muslim women who have been at the receiving end of this practice, have been suffering enough. ''There have been also instances if the husband was not happy with the food, the man would give instant talaq...One lawyer had divorced his wife just because she also wanted to divorce law,'' he said. The minister said the House has been witness to enactment of several laws which protected women but when it came to the interest of Muslim women, the Opposition members were raising objections.The Bill will again go to the Rajya Sabha for its approval. The Bill makes all declaration of Talaq, including in written or electronic form, to be void (i e not enforceable in law) and illegal.It defines Talaq as Talaq-e-biddat or any other similar form of Talaq pronounced by a Muslim man resulting in instant and irrevocable divorce. Talaq-e-biddat refers to the practice under Muslim personal laws where pronouncement of the word 'Talaq' thrice in one sitting by a Muslim man to his wife results in an instant and irrevocable divorce. The Bill provides that the Magistrate may grant bail to the accused but it may be granted only after hearing the woman. The Bill also says that a Muslim woman against whom Talaq has been declared, is entitled to seek subsistence allowance from her husband for herself and for her dependent children.